Snorkeling is one of the main attractions that draws thousands of visitors to the tiny southernmost island of Key West every year. Thanks to its close proximity and easy access to the country's largest living coral reef ecosystem, Key West is the ideal place from which to enjoy an unforgettable snorkeling experience. 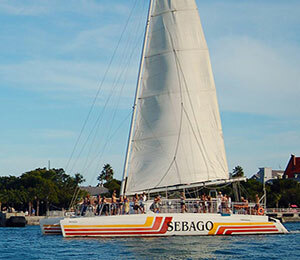 While the island offers all kinds of different water sports and activities, snorkeling is the timeless tried-and-true Key West watersport that visitors and locals alike continue to participate in. And thanks to the island's year-round warm summer-like weather, our Key West snorkeling reef trips go out twice a day throughout the entire year. Our spacious catamaran vessel provides our guests with a comfortable and easy ride through the clear-blue waters of the Gulf out to the coral reef areas. There are dozens of excellent areas for snorkeling along the coral reef gardens. Your captain will pick the best spot for snorkeling given that day's conditions and reports from previous snorkeling trips. Wherever you go, you can rest assured that you will have the Key West snorkeling experience you dream of. Snorkeling in Key West brings you face to face with a fascinating and colorful underwater world. Hundreds of different marine reef species make their home among a wide assortment of soft and hard coral formations. All our snorkeling trips come fully equipped with complimentary sanitized snorkel gear as well as complimentary beverages to quench your thirst. Snorkeling in Key West is easy for people of all ages who are comfortable in the water. Life jackets and expert instruction is provided to make the experience all the easier and more memorable to everyone on board!